[21:107] And We have not sent you, [O Muhammad], except as a mercy to the worlds. Q. I am a Non-Muslim and I would like to ask as to why I have seen many Muslims display the same seal as ISIS on their websites and blogs? Isn’t this association with a bloodthirsty monstrous cult? Your question is appreciated and you are more than welcome to send any similar queries our way. It is pleasing to see that you have taken the time to ask instead of just noticing a symbol and making up your mind. Let us begin by stating that our stance on Daesh (or so called “Islamic State”) has been abundantly clear long before the Media got on the ISIS bandwagon and we had not only denounced this monstrosity called Daesh from day one but took a principled stance that it has nothing to do with Islam. Having set the set record straight on Daesh, lets proceed and talk about the associated symbols and flags. Translation: There is no god but Allah, [and] Muhammad (Peace be Upon Him) is the messenger of Allah. There is no specific command or even recommendation in Islam to use it as a seal or inscribe it upon a flag or on a coin, nevertheless we find that throughout history and even today it is used for this purpose, the current flag of Saudi Arabia has this proclamation upon it. King Offia of Mercia, England had also minted a coin which had the (Islamic) procalmation on it, as seen below. Our point is that using the Islamic proclamation on a flag or coin long predates our contemporary discussions on symbols and their associations. 1 He had to dictate to others (to write) since he couldn’t write himself. 2 He had to use a seal since he couldn’t sign a document as he couldn’t write. 1 The second part of proclamation actually says "Muhammad (Peace be Upon Him) is the messenger of Allah"
2 The ring reads the reverse i.e. "Allah, Prophet and then Muhammad"
Some of his historical letters are still preserved in Museums and the (ring) seal can be seen at the bottom such as on this letter to a Monk. He signed a number of treaties and sent a number of letters in his lifetime, and some of them can be seen here. Similar to the proclamation is no specific command or even recommendation in Islam to use it as a seal or inscribe it upon a flag or on a coin, nevertheless historically we have found Sufi Muslims have used similar rings and symbols to signify their endearment and closeness to the Prophet. 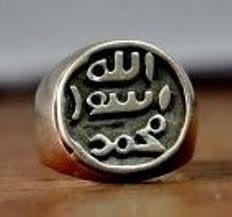 In Islamic Sufi tradition some of these rings are passed over generations from one Sufi Master to another. We are unable to explain the reasons for this madness! There is a long history of symbols being usurped and misused and the easiest you can relate to is the cross which is a symbol of Christianity. However, there are cult and occults around the world who have usurped and used it for their own nefarious and dark purpose. Therefore, should Christians disassociate themselves from the cross just because someone has adopted the cross and used it for their sinister purposes? It is also important to note that Sufi Muslims either use the entire (Islamic) proclamation OR they use the Prophetic Seal, they don't use half of proclamation combined with the Prophetic Seal, that is just bizarre combination, which makes no sense!